Over on Macintouch, reader Arthur Busbey complains that iPhoto 5's Slideshow button is disabled when you're viewing a shared photo library: "When I mount a shared volume the Slideshow icon is grayed out and unselectable. I tried this with shared albums and with shared slide shows. It appears that in iPhoto '05 you cannot make slide shows of shared images. For me this is a major disaster." The reality is more subtle and not nearly as grim. To understand it, you need to come to terms with the fact that iPhoto 5 provides two different kinds of slide shows. Let's call them permanent and temporary. A permanent slide show is one that you create with the Slideshow button: it hangs around in the Source pane of your iPhoto window, and you can apply all the slick new iPhoto 5 slide show features to it: Ken Burns, local effects, different transitions and durations for each image, and so on. As Arthur discovered, you can't create a permanent slide show using shared photos. When you think about it, that makes sense: how can iPhoto record what your image-by-image settings are if the images aren't stored in your local library? On the other hand, a temporary slide show is one that iPhoto 5 displays when you click the little play button in the lower-left corner of the iPhoto window. A temporary slide show doesn't hang around. Like a bad Broadway show, it plays once and then vanishes. You can't apply manual Ken Burns settings to its images, nor can you specify per-image durations, transitions, and effects. Ah, but here's where we put a smile on Arthur Busbey's face: you can create a temporary slide show using images from a shared library. Give it a try: connect to a shared library and then click the play button. To show only some of the shared photos, select them before clicking play. Now taking orders. Most of the information on the page isn't right, but Amazon is now taking pre-orders for The Macintosh iLife '05, the next edition of my book and its two-hour companion DVD. I'm so excited I could pant. A while back, I read about PodAPic on Leander Kahney's Cult of Mac site. 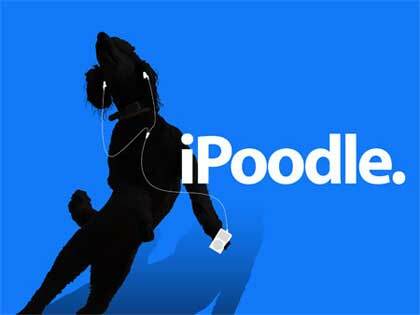 PodAPic will take an image you supply and, for a lowly $3.99, modify it to mimic an Apple iPod advertisement. Being a childless dog owner (you know who you are and you know what I mean), I knew I had to try it. 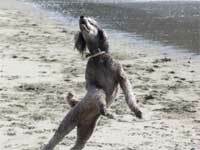 So I sent them this photo of Sophie, our standard poodle, leaping with joy at the beach. This morning's email brought the final results. Check it. PodAPic will take a JPEG image of up to 2MB, and returns a JPEG of the same resolution. You can even choose between a standard iPod or a shuffle. So. The question now is, do I have this image put on a T-shirt or a mousepad? Or both? The possibilities are exhilarating. This is what personal technology is all about. Yesterday was the Mac's twenty-first "birthday," and the Internet is humming with a QuickTime movie of Steve Jobs unveiling the first Mac at Apple's 1984 shareholder's meeting. According to some reports, the clip is from a "missing 1984 video" and contains "never-before-seen" footage. It's a nice story, but the reality isn't quite as romantic. The complete video of Apple's 1984 shareholder's meeting is alive and well in Apple's corporate marketing archives. Apple's public relations department sent me a VHS dub of it ten years ago, and I've shown bits and pieces of it at user group meetings since then. I even used some of it in a CD-ROM that I produced in 1994 to accompany my long-out-of-print Macworld Complete Mac Handbook. To add my small, bandwidth-friendly contribution to the 1984 noise, I extracted the audio track from my 1994 CD's movie and posted it as an AAC audio file. In this 548K download, Steve Jobs describes the Mac's components one-by-one, praising "the 3.5-inch disk as the disk of the 80s." Indeed, Steve is in his usual hyperbolic form; anyone who has listened to a recent keynote address will feel right at home. It's four minutes of happy driving down memory lane. In 1984, I was the Senior Technical Editor of Kilobaud magazine. Our staff traveled to Cupertino several times in the fall of 1983 to meet with members of the Mac team, and we got our own Mac prototype in November of that year. For a month or so, I had the pleasure of walking to work in the snowy town of Peterborough, New Hampshire with an unannounced Mac in its carrying bag. A few months later, I was surrounded by Macs and working on my very first book: on Macintosh Basic. I'll let Andy tell that story. Happy Anniversary, Macintosh. Thanks for the insanely great ride. UPDATED: Some people were having problems playing the QuickTime version of this audio, so I re-encoded it into AAC format -- and saved over 4MB in the process. Now you can carry 1984 with you on your iPod! Over at the Peachpit Press site, you can watch the first installment of iLifeTV. A weekly series of short QuickTime movies, iLifeTV is hosted by yours truly and highlights some of iLife '05's new features. The first installment is a four-minute tour of iPhoto 5's improved organizational features. Tune in! On last Wednesday's edition of Point & Click Radio, my friend Bob Laughton and I interviewed Andy Hertfeld, one of the original members of the Mac development team, creator of the Folklore Web site, and author of Revolution in the Valley, a fascinating and beautifully designed look at the Mac's development, as told by those who were there. If you missed the show, you can download a copy of the interview (49 minute AAC file, 6MB download). We talk about the Mac's early days, about Steve Jobs' influence on the industry, and much, much more. One of the things that makes the Flickr service so enjoyable for me is the ability to upload photos directly within iPhoto. Unfortunately, FlickrExport doesn't work in iPhoto 5. In fact, it breaks exporting entirely -- you have to uninstall FlickrExport to get the Export dialog box back again. In the Macintosh group at Flickr, Spiers reports that his copy of iLife '05 won't be arriving for at least a week. Until then, Flickr users should either postpone upgrading to iPhoto 5 (horrors!) or use Flickr's standalone Mac uploader. Note to Apple: You should send Fraser a copy of iLife '05 as soon as possible. The Macintosh group is one of the most active groups on Flickr, and that's due in part to his heroic efforts. UPDATE! Wow, things move quickly in this biz. Less than an hour after I wrote this post, Fraser had updated FlickrExport to work with iPhoto 5. I just tested version 1.2b2 (see the flower conservatory photo at right), and indeed, it purrs. Grab it, and show Fraser a little PayPal love while you're at it. It's a Good Day. It's all Heid, all the time. Tonight at about 6:30 pm Pacific time, I'll be a guest on Shawn King's Your Mac Life. I'll talk about iLife '05 and the Macworld Expo in general. Then, at 7:00 pm Pacific time, I'll hang up the phone in favor of the microphone -- and another edition of Point & Click Radio, the weekly computer show that I co-host with my friend Bob Laughton. Tonight, we'll be recapping the highlights from the Macworld Expo and interviewing Mac pioneer Andy Hertzfeld, the author of the new book, Revolution in the Valley: The Insanely Great Story of How the Mac Was Made. I've also been playing with Apple's newly announced iWork '05, and it's worth noting how well it works with iLife. Both Keynote 2 and Pages 1 provide a media browser that puts your music, photos, and movies at your fingertips. 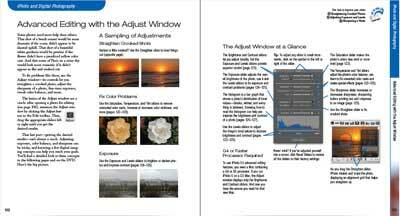 Want to add a photo to a Pages publication? Just drag it in and then resize it as desired. Pages doesn't automatically update the photo if you edit it in iPhoto, but it's easy enough to simply drag and drop the edited version into place. I digress. The point of this post is that Apple is extending iLife's reach. That isn't a first -- Apple's DVD Studio Pro also provides media browsers for photos, music, and movies. But it is a first for mainstream productivity software, and it's an advantage that Microsoft Office doesn't provide. And Microsoft Windows? It's still back in the cut-and-paste era. Memo to Bill: we've gone beyond the Clipboard over here. I'm back from the Macworld Expo, and my voice is returning to its normal state of hoarseness. It was a good show. Even though the news had leaked -- heck, gushed -- there was still a lot of buzz over Apple's announcements. Lines were long at the Apple Store in nearby Union Square, with people snapping up iPod shuffles (memo to Apple: embrace the Shift key!) as quickly as they could shuffle up to the cashiers. As for me, I always get a kick out of meeting readers and viewers. The kind words are tremendously gratifying, and make the long hours and sore wrists worthwhile. Thank you. The booklet's 16 pages summarize what's new in iLife '05, and on Friday, we'll be launching iLifeTV, a series of short, once-a-week movies that show iLife '05 in action. Now, though, I want to share a few iPhoto 5 observations and also get your feedback on what you'd like to see in the next edition of the top-selling book on iLife. There are wonders to behold across the iLife '05 programs, but from my perspective, iPhoto 5 is the star of the show. It's simple: if you use a digital camera, you'll want this upgrade. What's hot? Here's a short list. You can create folders in the Source list to organize albums, slide shows, and books. Organization freaks, rejoice. Slide shows and books are now separate entities, detached from the albums on which they're based. After you create a slide show or book, you can change the underlying album -- adding or removing photos, for instance -- without worrying about your change rippling through the slide show or book. This scheme also makes it easy to create several variations of an album or book. Slide shows are spectacular. Check the Automatic Ken Burns effect box to get pans and zooms, or take the reins and set up Ken Burns moves yourself. Add effects to images without having to alter the master images in your library. Specify different durations for each slide -- and different transitions, if you want to be tacky. And create 16:9 widescreen slide shows that do justice to your Cinema Display. You can also export your slide shows as QuickTime movies, and with more options than before. You can export in a few different sizes, including 720 by 480 (ready to import into iMovie HD). And if you used Ken Burns in your slide show, iPhoto renders those pans and zooms into your QuickTime movie. Dreamy. As for editing, iPhoto 5 is still a long way from Photoshop Elements, but the new Adjust panel provides the tonal correction features most photos need: levels adjustments; exposure, saturation, and color controls; and sharpening (it's unsharp masking, by the way). The Straighten slider is sheer brilliance, straightening and cropping a photo in real time, as you drag the slider. Why hasn't anyone thought of this before? Is there something special in Cupertino's water? And then there are iPhoto books. If you weren't a book publisher before, you'll become one now. 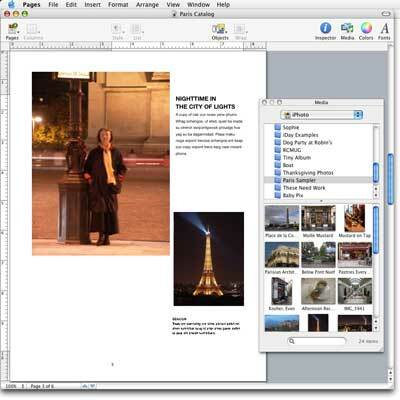 For starters, laying out a book is much easier than in earlier iPhoto versions. Deleting a photo from one page doesn't cause a nightmarish reflowing of photos in subsequent pages -- it simply leaves an empty drop zone, ready to accommodate a new photo. A new manual-layout mode lets you drag photos onto pages by hand from the new photo browser area at the top of the window. The new book designs are spectacular, too -- richer and far more elegant than the bland designs from earlier iPhoto versions. The ability to print on facing pages to create true, two-page spreads is also magnificent. I can't wait to try splitting a panoramic photo into two photos, and then positioning them opposite each other on a spread. There's so much more to talk about in iPhoto 5, but I want to turn things over to you now -- specifically, to those of you who you have bought previous editions of my book/DVD. What would you like to see in the next edition? What kinds of video tutorials do you want on the DVD? Where did I miss the boat in the last edition? What did I get wrong? How can I make The Macintosh iLife '05 a must-buy update? I've been working with iLife '05 for a while now, and revisions are well underway. But there's still time for you to influence the next edition. Tell me what you want. iLife is about to get better. At today's Macworld Expo in San Francisco, Steve Jobs unveiled iLife '05, a new version of Apple's personal digital media studio. Available on January 21 for $79 (and, as always, bundled with new Macs), iLife '05 includes new versions of iPhoto, iMovie, iDVD, and GarageBand. Each program is refined and enhanced, and all four programs -- along with iTunes -- work together better than ever. 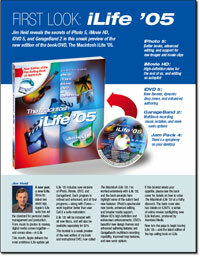 I've been working with iLife '05 for some time now, and I'm already hard at work on the next edition of my book/DVD. To whet your appetite, I've written a 16-page "first look" containing excerpts from the next edition of my book. The preview contains full details on iLife '05's greatest hits: iPhoto's spectacular new books, enhanced editing, and broader media support; iMovie HD's high-definition and widescreen enhancements; iDVD's beautiful new design themes and enhanced authoring features; and GarageBand's multitrack recording capability, improved loop features, and new sonic options. Like everything that comes from the collaboration between Avondale Media and Peachpit Press, the preview is in full color and is drop-dead gorgeous. If you're attending the Macworld Expo, stop by the Peachpit Press booth and pick up a copy. If you aren't attending, we'll send you a PDF. Just enter a valid email address and ZIP code in the boxes below, and we'll email the PDF to you. Expo attendees: Remember, I'll be talking about iLife '05 at my Peachpit Press booth appearances: Tuesday from 3:30 to 4:00 pm, and Thursday from 2:30 to 3:00 pm. If it's January, it must be time for another Macworld Expo. Indeed it is, and I'll be there, talking about iLife, signing books, and gaping at whatever rabbits the magician in blue jeans and black turtleneck pulls out of his hat on Tuesday morning. Tuesday, January 11, 3:30 to 4:00 pm. iLife presentation and book signing, Peachpit Press booth. Thursday, January 13, 2:30 to 3:00 pm. iLife presentation and book signing, Peachpit Press booth. Thursday, January 13, 3:30 to 4:45 pm. User Conference Session. "From Hollywood to MTV: Power Editing with iMovie." How to take full advantage of iMovie's editing features, with additional iLife insights sprinkled in along the way. Room 131.